Surveillance cameras come in many shapes and sizes, some are so small that they are hardly recognisable as cameras. This means the number of places they can be hidden with relative ease has increased. It also makes surveillance camera detection more difficult, so it helps to know some of the more common places to look. If you keep getting the feeling that you are being watched, there is a possibility that you are, with the assistance of a hidden camera. These devices can be placed in a number of areas around the home where they remain unnoticed for long periods of time. One of the most common places to find a camera is within a smoke alarm. The positioning of smoke alarms in hallways make them ideal for monitoring who is coming and going. If you find there are more smoke alarms than you would expect, or they are positioned in strange places, such as the bedroom, you may want to take a much closer look at them. Electrical sockets also make great hiding places for cameras. It doesn’t take much to work out which sockets you don’t use very often and to hide a camera behind the faceplate. Cameras do not need fixed items in the house to be effective. They work just as well when hidden in plant pots, artificial flowers, picture frames, lamps, radios and even air purifiers. If you have noticed that something is even slightly out of its normal position, then it is worth doing a little bug detection of your own. Of course, if you find any evidence of hidden devices you should contact a counter surveillance expert straight away. If you are in need of an expert service for surveillance camera detection, then look no further than Advanced Sweeping. We have the skills and equipment necessary to find every hidden camera in your home or place of work. 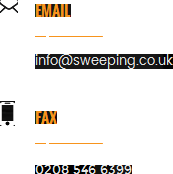 Contact us securely on 0845 512 1552 or visit our website (http://sweeping.co.uk/) to learn more.